In order to prepare for the swarming mass of humanity that is Vegas during CES, we first spent a few days in the still and the silence of the Arizona desert, exploring landscapes that had echoed through our reading. 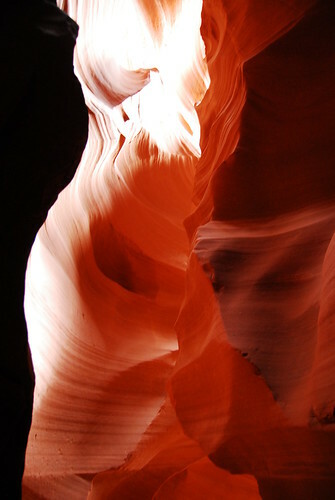 One place we visited was Antelope Slot Canyon, on Navajo tribal land near Page. 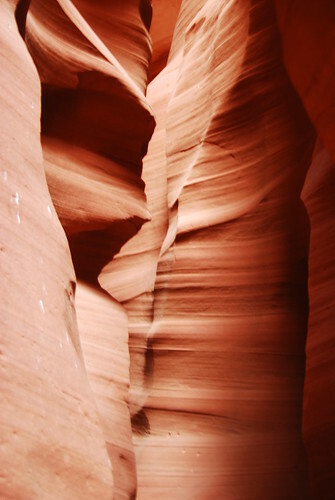 It is one of the most beautiful places I have ever been, a narrow ribbon carved through twisted layers of sandstone, worn away by the wind and the dust. 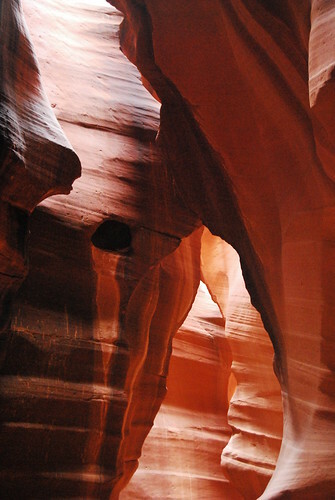 This is what nature's sandblaster can do, given a few million years. We will be back, some spring day when the light is at its best. These really are gorgeous. Particularly the first photo, which reminds me of cubist Picasso. That's truly one of the most amazing places on the planet. I class it alongside the cave full of giant crystals (as seen on the BBC's "Planet Earth"). Wow! Amazing, and especially the top photo. That is exquisite! Of all the time I have spent in the desert, I have not visited that area. How difficult is it to get there? It's just a mile or so outside Page AZ. You do need a guide to enter it though - it's on tribal lands and there were some flash flood fatalities a few years back. Small world Simon. I remember us sitting next ot each other at ECSoft, at least occasionally: in that ill fated eCommerce Group. I stayed in page for a few days and saw AC as well: very, very impressive. But next time your there try driving from Page to Monument Valley - so that you get there before 6am, the sunrise / opening time. Now that is a trip I will not forget: do it on a school day if possible. The 1st Mesa Hopi Indian reservation was, for me, even more impressive: I was lucky enough to time it during a festival. But photographs are a no no - at least for non Hopi & the very early drive from Page is a bummer!